Massive galaxies like our Milky Way all contain a supermassive black hole (SMBH) at their center, with masses ranging from 106 to 109 solar masses. The SMBH suspected to sit in the center of our galaxy, known as Sgr A*, is estimated to be around four million solar masses. Although we know they exist, how they form is still an unanswered question in astronomy. The challenging question is how so much mass can collapse into such a small volume (about 100 AU for our SMBH) fast enough that we observe them in the early universe as the power source of quasars, less than a billion years after the Big Bang (z ~ 7). There are three likely possibilities, all of which involve forming “seed” black holes that grow over time to SMBH size: 1) low mass seeds from the deaths of the first stars, 2) the direct collapse of massive regions of gas into a black hole, forming massive seeds, and 3) mergers of stars in dense star clusters, forming a very massive star, and, in its death, a very massive black hole. The authors use hydrodynamic simulations to examine the direct collapse to a SMBH of a region of gas formed from the merger of two Milky Way mass galaxies. The authors use a simulation code called GASOLINE2, which, at its core, models the flow of gas as individual particles in what is called smooth particle hydrodynamics. The biggest challenge in creating direct collapse SMBH seeds is keeping the gas cloud coherent throughout the process. These massive clouds can often break apart, or fragment, during collapse, forming stars or less massive black holes. The authors use a more efficient, lower resolution setup to simulate the merger of two galaxies of masses around 1012 solar masses each, then “zoom-in” with higher resolution in the final merger stages to observe the gas collapse at the core of the newly formed galaxy, exploring whether or not the cloud can direct collapse, or fragments over time. Fig.1 gives a projection of the surface density of gas of their two galaxies, and a zoom into the core of one, roughly three thousand years before the galaxies merge. The new work the authors put into modeling the direct gas collapse process is to include the effects of radiative cooling and a model that accounts for changes in opacity due to dust, dust heating and cooling, atomic and molecular heating and cooling, and cosmic ray heating. These processes together may stabilize the cloud against fragmentation, more easily forming a SMBH seed, or they may cause dramatic fragmentation of the cloud (bad news for the SMBH). Fig. 2 shows the central galaxy region, where the massive cloud ultimately forms, at five thousand years after the two galaxies merged. The panels show 4 different simulations, each of which testing the effects of including or removing different physical processes. 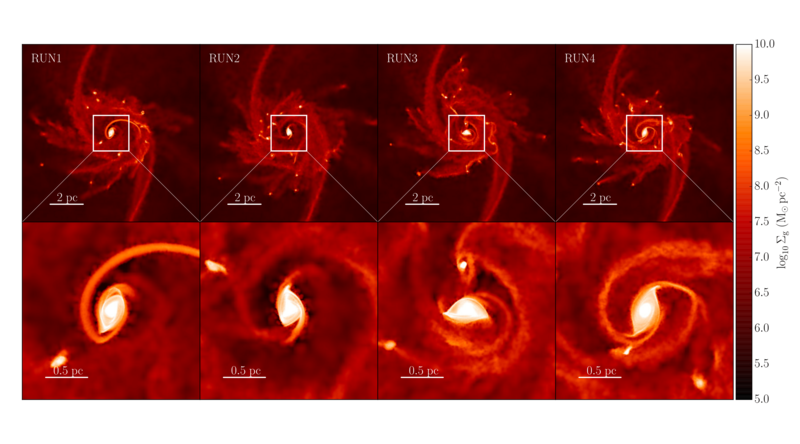 In each case, the central region is a single, massive (roughly 109 solar masses) disk-like structure. The gas clumps around the core are examples of gas fragmentation that could ultimately form stars. As the core evolves, it remains intact from heating due to shocks, turbulence, and its high opacity to radiation; these all prevent cooling, which can spawn fragmentation. Unfortunately, the authors can only follow the evolution of the central core for around 50 thousand years before they hit computational limits. By this, I mean that continuing to evolve the simulation would require too high a resolution than is computationally possible. In addition, as the core collapses and shrinks in size, the minimum time step drops dramatically and the simulation speed slows to a crawl. Fig. 3 shows the final evolved state of the core 30 thousand years after merger for Run 4 shown in Fig. 2. As shown here, the core actually fragments into two massive gas clumps, one at the center, and one slightly off-center. These clumps are about 109 and 108 solar masses respectively, and may ultimately form two SMBH’s that could eventually merge into a single SMBH as the galaxy evolves. Using analytic calculations and results from previous work, the authors make some simple arguments for how the final gas clouds in Fig. 3 can form into black holes via direct collapse. They argue it is possible that these can form into SMBH’s in a ten thousand year process through a collapse generated by general relativistic instabilities. This work provides new insight into how SMBHs may form in the early universe from the direct collapse of gas clouds. The authors conclude by suggesting that future simulations including general relativity and observations by the James Webb Space Telescope and the Atacama Large Millimeter Array will be invaluable to better understanding how SMBH’s can form from direct collapse of gas clouds.